Last Sunday was St. Nick's Day. This was never a holiday we celebrated when I was a child. I think it's a Catholic thing, perhaps. In college, my good friend Patty received a care package with an ornament and other goodies every December 6th. It was the first time I'd heard of St. Nicolas' Day. Fortunately for my kids, St. Nick has crossed the Protestant lines and visits our house every year. 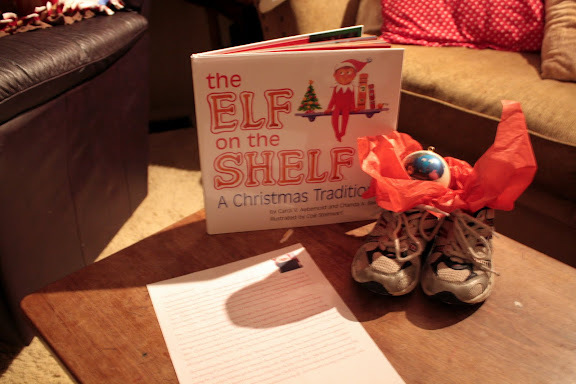 At the No.6 Cottage, he leaves an ornament in the shoes he finds sitting on the coffee table (although I hear he may leave a few more things in other houses in the neighborhood). Around here, it seems St. Nick might procrastinate most years in determining what the children of the house might like for their ornament. This year, however, I know for sure that St. Nick didn't procrastinate. He ordered the ornaments from his elves quite early, in fact, it is my understanding. But on the Friday before his special day, St. Nick discovered the Jungle Junction ornament specially ordered for Meiners would not be ready in time. So he penned a special note suggesting a bungle amongst the elves that he would rectify by returning to St. Louis quick-as-a-lick when they had his ornament ready. Finally, Tuesday night, he returned. And he brought along his trusty Shelf Elf. Because, apparently, I hadn't been keeping up with the Advent Calendar. He also sent me an invisible-ink letter meant for my eyes only to reprimand my waywardness and to let me know where he'd stashed a bunch of special Santa candy --- to be used daily, just for the Advent Calendar. Later that day, Meiners reported in the car that he was relieved St. Nick had brought him that ornament. Because he'd been thinking he must have been a bad boy to not receive an ornament like the other kids (despite the letter...). I think St. Nick may have sent a VERY nasty email to the elves who didn't put the ornament in his burlap sack, even though he had requested it from them special early in November. He may have even called their customer service terrible (and he doesn't 'cuss' like that often, as you and I both know). Needless to say, St. Nick's Day was redeemed and that shelf elf is keeping his eye on me. Although he did travel from the North Pole Friday night to my in-laws since the kids spent this weekend there. Surprisingly, he was found hanging out in our curtains when the kids returned home this morning. I love Christmas with all its traditions - old and new.